Seriously? OMG! WTF?Elton John Archives - Seriously? OMG! WTF? 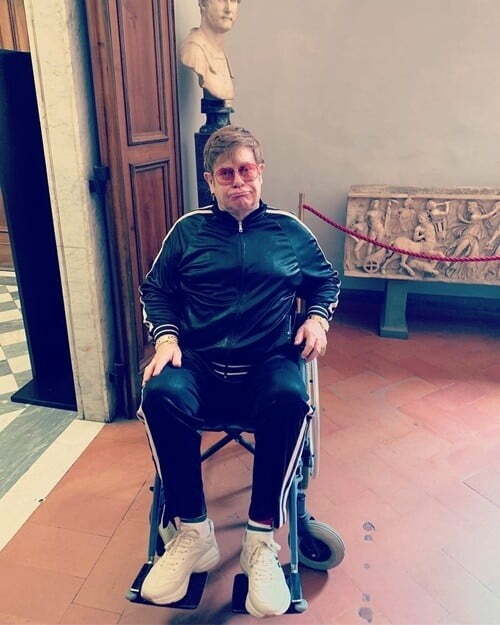 Why is Elton John in wheelchair? Hopefully, he will be better soon because he still has a lot more of his tour to do. If you have never seen him live, now is the last time to see him do it. It is worth the money because I have seen him perform in a huge arena, a converted movie theater and a really small intimate gathering. I will not forget any of those spectacular performances and you will never forget seeing him live too. Elton John has many hits throughout his long career, but I think Your Song is his greatest one of all. I am not alone because UK’s John Lewis & Partners thinks the same thing. An important message that was beautifully conveyed. If this does not get you in the Christmas spirit, nothing will. No one can deny that Elton John has led quite the life. Therefore, it should no surprise to us that his story is getting the big screen treatment in Rocketman. I do not know about you, but I cannot wait to see this movie in May. Rockers like him were so much cooler from that generation. Which is why we want to their lives in movies. Who is next? Who’s sad that BSB’s Don’t Go Breaking My Heart is not a cover of Elton’s hit? Back in 1976, Elton John and Kiki Dee released their timeless hit Don’t Go Breaking My Heart, and it has been covered several times since then. Today, when I got an email that Backstreet Boys released their first single in five years called Don’t Go Breaking My Heart, I thought it was a remake of that tune. As soon as I hit play, I knew it was an original song. As much as I like it, I am still disappointed that it was not their take on the Disco duet. What about you?